Image editing tools are numerous on the Internet but for Mac OS X, they are becoming rare. ImageWell is one of the tools enabling to edit images for Mac users. ImageWell is complete in terms of image editing. It is offering quite all the necessary tools for image editing such as resizing, rotating, cropping, flipping, adding texts, graphics, watermarks, effects, font control panel, objects, backgrounds and much more. Upgraded to version 4, some features have been enhanced and some deleted for easy handling. For instance, ImageWell no longer performs batch processing. If you want this feature you have to use the version 3. Meanwhile, some new technologies have been added such as Core Image for image filtering, Quartz for rendering images, Curl for sharing images to externals servers and many more. ImageWell supports drag and drop option for importing and exporting images. It is also possible to import images directly from digital camera. Concerning sharing option, one click is enough to send edited images to your iDisk, FTP, SFTP or WebDAV server. 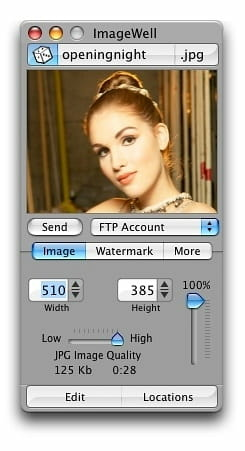 Images can be sent in batch to Flickr, SmugMug or ImageShack account. ImageWell is available in 15 different languages: English, Czech, Danish, Dutch, French, German, Italian, Japanese (partial), Polish, Portuguese, Russian,Spanish, Swedish, Simplified Chinese, and Traditional Chinese. Two or more different versions can run in a system. Latest update on September 23, 2016 at 12:59 PM.